April 2nd is International Autism Awareness Day, but really, if you’re not aware of autism yet, where have you been? The cool kids have already moved on from mere awareness to inclusion, acceptance, and love. We’re celebrating Autism Acceptance Month. Many of my friends in the autism community find mere awareness campaigns to be painful, because the messages about autism tend to be so bleak and panicky, full of doom and gloom. This dehumanizing talk is a pretty good way to get people to go on walks, light things up blue, and give money to giant organizations, but it can have a very negative effect on the real lives of autistic people themselves. Luckily, when you can move forward from mere awareness into acceptance, you can create a better world for autistic people — and for everyone. Here in the U.S., the blue light and puzzle piece are corporate logos of the very powerful organization, Autism Speaks, which focuses most of its donated dollars on genetic research (to prevent future autistic people from being born), and only a very small percentage on direct help for children, adults, and families. Autism Speaks is not respected within the autistic community, because its panicky and dread-laced messages — and its siphoning of money out of communities and into research instead of support — make things worse, not better, for autistic people. Consider how would you feel if your neurology, your behavior, and your presence in the world were treated as tragedies. It would be very difficult to look forward to the future, or to feel safe in the world when people send up alarms and blue lights every year to focus on you as a problem. It’s not supportive at all to treat autistic people as problems. There are better ways to help. Thankfully, there are organizations that focus on autism acceptance, and on helping autistic people and their families lead happier and more fulfilling lives. I’ve included some great resources at the bottom of this post. Autism can be a complex condition that affects people in many different ways, but it’s not a tragedy, nor an epidemic, nor a puzzle. The real autism experts are (surprise!) autistic people themselves, and they’re communicating for themselves and working to make the world better for everyone with every kind of neurology. If you’d like to learn about autism in a way that is respectful, educated, acceptance-based, and full of empathy, this online booklet, Welcome to the Autistic Community! is a wonderful place to start. (A version for adolescents is here). My autistic friends are wonderful individuals with meaningful lives and extensive empathy. But I never would have known that if I had stayed in the cold, harsh, blue light of mere awareness (see Autism, empathy, and the mind-blindness of everyday people). Why in the world would you be blue if you could instead celebrate the whole spectrum? Why would you hold up a puzzle piece, as if autistic human beings were a mystery? They’re not mysterious at all if you just talk to them, listen to them, empathize with them, and focus on their true needs. For instance, in my master’s thesis, I asked autistic people about the social skills training they are subjected to, and the information I gathered was astonishingly rich and deep. Why did no one think to ask autistic people about their lives before my study did? Why do academics and reporters not include autistic people’s voices in stories about autism? These panicky and gloomy awareness campaigns, full of pity and grief, are big culprits in the silencing of real autistic people, and they need to fade away. We can change the world for and with our autistic loved ones, but first, we have to change the light in which we view them. There’s no need to stand under a harsh, cold, puzzling blue light filled with messages of dread and despair. There’s a better and more humane way to view our friends on the Autism Spectrum — and build a world where they’re welcomed, supported, and loved. If you want to become more aware of the issues in the autism community, the documentary Loving Lampposts is a wonderful entree into new ways of viewing autism in a more humane, loving, and workable way (and you can watch it for free at Snagfilms). 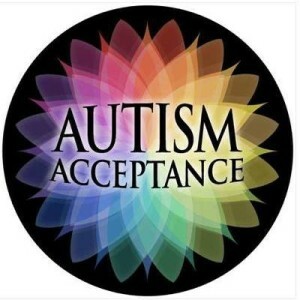 So don’t be blue: have a great Autism Acceptance Month, and bask in the light of the full spectrum of human neurological diversity! 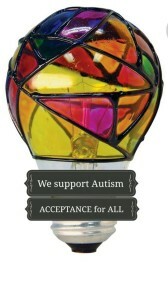 Thank you, and have a wonderful Autism Acceptance Month, Year, Decade, and Eon! Thanks for being so positive about autism. I get judged and looked at weird by people for being different. Thanks Matix. Judging people for being different is a very strange thing to do, since we’re all different! It seems like an unhealthy area of human behavior, I think.